In July 2013 the European Respiratory Society (ERS) developed its 2013–2018 strategic plan to serve its members better and achieve its mission objectives (table 1) . The outcomes of the previous 2006–2007 Strategy Meeting  summarising the ERS pillars (figure 1) and the recently published ERS Presidential plans were used as background material [3–5]. The three pillars of the European Respiratory Society. The mid-term strategy implementation review was held on October 21, 2015 in Amsterdam, The Netherlands. It involved the ERS Leadership represented by the members of the Management Group (figure 2), the body that replaced the previous Steering Committee as per the newly approved ERS Constitution and Bylaws [6, 7], as well as the ERS Office represented by the ERS Executive Director on behalf of an internal ERS Office Strategy Review Task Force. Input from the Assemblies was requested during the 2015 ERS International Congress in Amsterdam and was taken into consideration during the discussion. 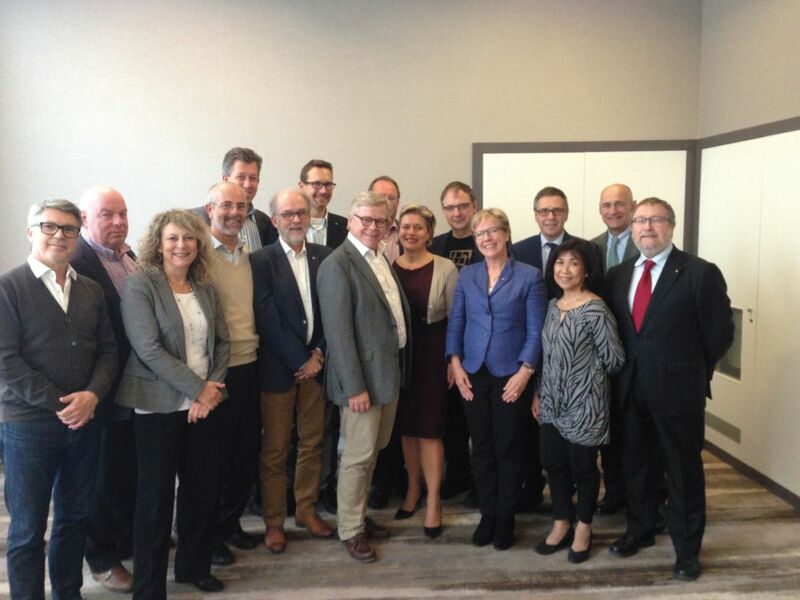 The mid-term European Respiratory Society strategy meeting in Amsterdam, The Netherlands. The aims of the review were to: 1) evaluate the implementation status on each of the strategic decisions with recommendations on action items; 2) discuss, based on the status report, further actions related to budgetary and long-range planning considerations; and 3) ensure that what the ERS has committed to deliver to the membership is indeed accomplished. The review was also aimed at delivering the following outcomes. 1) An annual ERS internal booklet produced by the ERS Office summarising, in brief, the essential points of the budget for the incoming fiscal year and additional long-range planning (starting with the 2016/2017 budget). 2) An ad hoc excerpt of the status of the Strategy Implementation to be included in the ERS Annual Report, with an update on the implementation of the strategy (starting with the 2015/2016 Annual Report). 3) A timetable for further ad hoc strategic Management Group meetings on selected priority topics (Congress, science/research/publication, education, advocacy and governance) to be organised between 2016 and 2018 in view of the next ERS strategic review. The review was prepared using the same methodology as the Strategic Plan and was chaired by the ERS President and moderated by the ERS Secretary General, with the support of the ERS Executive Director, the Director of Finance and the Head of the Executive Office, who provided the necessary details on the documentation to be discussed. The eight strategic areas for discussion were: 1) remaining European or going global; 2) expanding membership; 3) coordinating with other societies; 4) strengthening science; 5) improving education; 6) improving publications; 7) coordinating and enhancing advocacy; and 8) organisational changes to put in practice the decisions taken. Strategic decision 1: remaining European or going global? • Further develop the ERS International Congress programme. There was agreement that ERS is properly implementing its “magnet effect” considering the outcomes of both the Congresses and the membership programme (see strategic decision 2). The ERS International Congresses in Munich (Germany) and Amsterdam were extremely successful both in terms of scientific programme (5506 and 5421 submitted abstracts, respectively) and attendance (21 948 and 23 292 registered participants, respectively). The Management Group recommended that the Science and Education Council fine-tune the international involvement in terms of both Chairs and Speakers, via the ERS International Congress Programme Committee, as much as possible. The sessions translated into Chinese, Spanish/Portuguese and Russian in Amsterdam were successful and will be repeated in 2016 with the addition of a session in French. The Science Council, in collaboration with the Management Group and the Executive Committee, will develop, based on the experience gained, criteria and modalities to embed these special sessions into the Congress programme without compromising on its quality, and taking into consideration the voice of the partner societies and the different activities (e.g. Postgraduate courses) that are going on in parallel. Overall, as the International Congress remains the key ERS event the Management Group decided to plan a specific meeting in the future to discuss opportunities to further improve the ERS International Congress. The implementation of the strategic decision was approved. • Launch the “Fellowship of the ERS” (FERS) programme. The ERS has developed agreements with European societies and several non-European regional and national societies; agreements have been signed with 159 societies in 45 countries. The progression in the number of members is summarised in figure 3. European Respiratory Society membership progression from 2014 to 2016. The Management Group agreed that neither the number of members nor the revenue generated by the Membership Programme represent the true value of ERS membership, but the contacts generated from the new members and the possible interactions initiated by each member are the genuine ERS objectives. The Management Group valued the existing collaborations with partner societies, both at the scientific and educational level (see strategic decisions 4 and 5), and at the level of specific activities requested by partners (e.g. collaboration on spirometry and tuberculosis elimination in Latin America). The Management Group also confirmed the need to maintain the planned approach to decide on collaborations, based on Management Group and Executive Committee and budget discipline. The FERS programme, aimed at recognising outstanding contributions to respiratory research, education and clinical practice, was successfully launched at the ERS International Congress in Munich (127 founding FERS members) and was continued in Amsterdam (27 new FERS members). • Support the Forum of International Respiratory Societies (FIRS) and the Alliance for Biomedical Research in Europe (BioMed) Alliance. The importance of emphasising a unified action to promote global respiratory health through the different collaborations was confirmed by the Management Group; this includes continued collaboration within FIRS. In Europe, the collaboration with the BioMed Alliance will continue in order to promote the importance of clinical and translational research and to influence decision makers in the European Union . Last, but not least, the collaboration with WHO is considered strategic. At present different agreements are in place with their European office in Copenhagen (Denmark) on the tuberculosis Consilium [9–11], and their office in Geneva (Switzerland) on eHealth/mHealth [12, 13] and on noncommunicable diseases. Reconfirming the key role of science (basic, translational and clinical, research) as a major pillar of the ERS, the progress achieved by integrating science with clinical activities within the International Congress was recognised by the Management Group. The White Paper (which aims to describe the activities, structure and finance model of a Research Agency) has been approved by the Executive Committee, enabling more actual discussions on the launch of an agency . The restructuring of the Assemblies has been discussed at different levels (Group, Assembly and Executive Committee). In view of the different opinions on the best approach to follow, a Working Group will be formed (under the coordination of the Science and Education Councils) to discuss alternative solutions that will then be debated in the Executive Committee before a final decision can be taken. • Balance Continuous Professional Development (CPD), Continuous Medical Education (CME) and accreditation. The Management Group acknowledged the important progress achieved in integrating Science and Education and implementing the International Congress Programme Committee. HERMES and other educational activities [15–21] have been discussed. In particular, the opportunities offered to collaborate with partner societies in developing HERMES projects in different languages (following the example of the successful examination conducted in Brazil) have been underlined. The coordination through HERMES certification and re-certification in Europe will continue to be discussed. • Investigate the possibility of becoming a publishing services company. ERJ Open Research has been successfully launched as planned. It will hopefully contribute to an increase in the impact factor of the European Respiratory Journal, which is on track to overcome the threshold of 8 in 2016 according to the plan of the current Chief Editor [22–27]. Following a mandate by the Executive Committee, the ERS Office has started exploratory work on the possibilities to transform the present business model of ERS publications into a publishing services company. • Develop officer-lead advocacy assignments. Coordinated advocacy is growing, not least through the Healthy Lungs for Life initiative and the collaboration with ELF, as well as the BioMed Alliance and ECDA. A specific effort may be needed to coordinate the different ERS advocacy activities at different levels (Advocacy Council, ad hoc committees and collaboration with other societies) (see strategic decision 3) and will be further discussed in 2016, possibly through focused discussions with different ERS stakeholders aimed at improving the effectiveness of ERS advocacy based on the change in the ERS that has taken place over the past few years. • Fine-tune the ERS Organogram. The core role of the ERS Office in professionally coordinating the relationship with partner societies was acknowledged by the Management Group. In order to fulfil the ERS goals and objectives and properly implement the strategy, fine-tuning of the ERS Organogram will be discussed under the responsibility of the ERS Executive Director and the remit of the ERS Secretary General. Overall, the Management Group recognised that all the activities of the ERS 2013–2018 Strategic Plan have been implemented as expected or have even exceeded expectations. The single major activity needing further discussion is the restructuring of the Assemblies. The newly implemented Working Group involving the Science and Education Councils will start to explore this in detail. Also, more discussions are needed before a final decision is made on the launch of a Research Agency. Ad hoc meetings will be organised in 2016/2017 in recognition of the importance of planning the core activities including the ERS International Congress, science/research/publication, education and governance, and advocacy. The European Respiratory Society plans its future: the 2013–2018 strategic plan. Eur Respir J 2014; 43: 927–932.
. The ERS Strategy report. Lausanne, European Respiratory Society, 2007. Future Directions for the ERS: presidential plans. Eur Respir J 2013; 42: 875–880.
. Presenting the European Forum for TB innovation: innovative thinking in progressing towards TB elimination in Europe. Eur Respir J 2012; 40: 806–808. van der Werf MJ, et al. Supporting TB clinicians managing difficult cases: the ERS/WHO Consilium. Eur Respir J 2013; 41: 491–494. European Respiratory Society. Constitution. www.ersnet.org/images/stories/pdf/Constitution_ADOPTED_in_Amsterdam_2015.pdf Date last accessed: January 21, 2016. Date last updated: October 2015. European Respiratory Society. BYLAWS (adopted in Amsterdam 2015). www.ersnet.org/images/stories/pdf/Bylaws_ADOPTED_in_AMS.pdf Date last accessed: January 21, 2016. Date last updated: October 2015. ERS is founding member of a new Alliance for Biomedical Research in Europe. Eur Respir J 2011; 38: 237–238. ERS/WHO tuberculosis consilium: reporting of the initial 10 cases. Eur Respir J 2014; 43: 286–289. Supporting clinical management of the difficult-to-treat TB cases: the ERS-WHO TB Consilium. Int J Infect Dis 2015; 32: 156–160. World Health Organization. Digital Health for the End TB Strategy: an Agenda for Action. Geneva, WHO, 2015. The ERS Research Agency: the beginning. Eur Respir J 2015 (In press DOI: 10.1183/13993003.02109-2015). HERMES criteria for accreditation of European Training Centres: overcoming challenges of accreditation. Eur Respir J 2010; 36: 1239–1241. Sleep HERMES: a European training project for respiratory sleep medicine. Eur Respir J 2011; 38: 496–497. Respiratory critical care HERMES syllabus: defining competencies for respiratory doctors. Eur Respir J 2012; 39: 1294–1297. De Ruysscher D, et al. Thoracic Oncology HERMES syllabus: setting the basis for thoracic oncology training in Europe. Eur Respir J 2013; 42: 568–571. Harmonising spirometry education with HERMES: training a new generation of qualified spirometry practitioners across Europe. Eur Respir J 2011; 37: 479–481. Paediatric HERMES: update of the European Training Syllabus for Paediatric Respiratory Medicine. Eur Respir J 2009; 33: 464–465.
. European curriculum recommendations for training in adult respiratory medicine: crossing boundaries with HERMES. Eur Respir J 2008; 32: 538–540.
. The making of the ERJ: behind the scenes and Editors’ cut. Eur Respir J 2010; 36: 4–5. ERS publications: the flagship and the fleet. Eur Respir J 2012; 40: 535–537.
. The ambition of the European Respiratory Journal: chapter 2. Eur Respir J 2014; 43: 1–2. The ambition of the European Respiratory Journal: chapter 3. Eur Respir J 2015; 45: 1–6. The ambition of the European Respiratory Journal: chapter 4. Eur Respir J 2016; 47: 1–4.